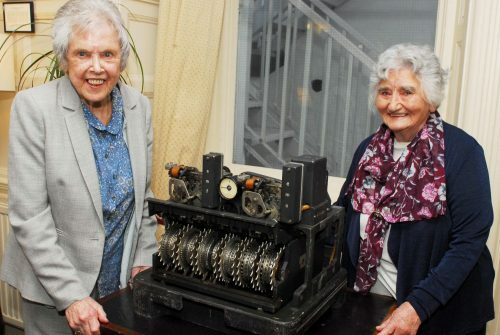 The pinnacle of code-breaking at Bletchley Park can now be told in its entirety from encrypt to decrypt using the full set of 1940’s cutting edge technology following the presentation today of an extremely rare Lorenz SZ42, Hitler’s “unbreakable” cipher machine, for display at The National Museum of Computing. The breaking of the top-secret Lorenz messages of German High Command is credited with shortening the war and saving countless lives. Much more complex than Enigma, the Lorenz cipher could be broken only thanks to Bill Tutte’s deduction of the architecture of a Lorenz machine without ever having seen it. As a result, the Allies were routinely able to read German High Command’s top secret messages. From 1944, with the creation of the Colossus computer by Tommy Flowers, the Allies were able to reduce the decrypt time from weeks to hours, a speed that effectively undermined the German military machine. At a ceremony in central London, Lieutenant Colonel Stein Wilhelm Aasland of the Norwegian Armed Forces Museum presented a Lorenz SZ42 as a long-term loan to Andy Clark, Chairman of TNMOC. The audience included two Wrens who had worked on Colossus along with relatives of those involved in the breaking of Lorenz. It is estimated that about 200 Lorenz machines were in existence during World War II, but only four are known to have survived. The particular Lorenz SZ42 machine to be displayed at TNMOC has the serial number 1137 and was used at the German HQ in Norway at Lillehammer, north of Oslo. Since Norway was occupied by the Germans until the end of the war, we believe it will have received the final surrender instruction message at 24:00 hrs on 8 May 1945, marking the end of the war. The loan of a Lorenz SZ42 machine to TNMOC completes the set of artefacts that tell the remarkable Lorenz story in its entirety from encrypt to decrypt. Nowhere else in the world is it possible to see the full range of innovative technologies used by both the British and the Germans to send and receive the most complex and important encrypted messages of World War II. 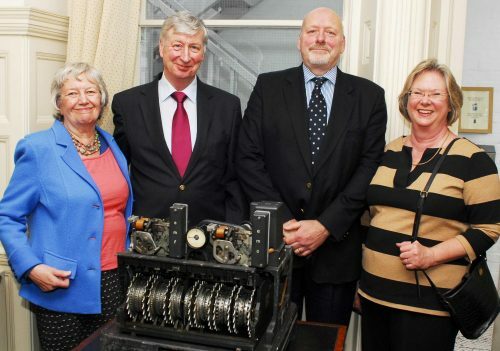 Receiving the Lorenz machine, Andy Clark, chairman of TNMOC, said: “We are enormously grateful to the Norwegian Armed Forces Museum for its generous loan. It completes a truly unique set at TNMOC and helps bring further life to the story that we have always wanted to tell as clearly and dynamically as possible. The technologies at the core of the Lorenz story – encryption, communications and computing – are at the very heart of our modern world, so the narrative is as relevant today as it was then and an inspiration to the next generation of computer scientists and engineers. Present at the hand-over ceremony were two Wrens, Betty O’Connell and Irene Dixon, who had operated the very first Colossus; William Tutte, a cousin of the wartime Bill Tutte who first deduced the architecture of the Lorenz machine without ever having seen it; Kenneth Flowers, son of Tommy Flowers, the designer of Colossus; and Mei Roberts, wife of the late Jerry Roberts who helped decipher Lorenz messages in the Testery by hand. A re-union of Colossus veterans and relatives of those connected with the breaking of Lorenz is to be held at The National Museum of Computing later this spring. The Tunny and Colossus Galleries are open every day to visitors and tell the complete story of the Breaking of Lorenz. They tell the entire World War II code-breaking process of the Lorenz-encrypted messages (known as Tunny in the UK) from encrypt and transmission in Nazi-occupied Europe to intercept and decrypt in Britain. Lorenz SZ42 – to generate the encrypted traffic Only four such devices are known to exist today. Ablesetafel 40 or Spruchtafel – to identify the wheel settings that the operator should use on the Lorenz machine. Only two such devices are known to exist today. Lorenz teleprinter connected to the Lorenz SZ42 cipher machine – for the operator to type the message in plain text on the keyboard. Reconstruction of part of the Knockholt Y station – where interceptors would identify and record incoming encrypted Lorenz traffic. Undulators – to record the incoming encrypted traffic on paper ‘slip’ tape for translation. Perforators – to transfer the encrypted message onto five-hole punched paper tape after operators read the ‘slip’ by eye. The Colossus Rebuild – to find the wheel start positions used by the Lorenz machine from the five-hole punched paper tape. The Tunny Reconstruction – to decrypt the Lorenz traffic having been set up with the wheel settings found by Colossus. Teleprinter – to print the decrypted text (in plain text German). Heath Robinson reconstruction – ongoing reconstruction of the wheel-finding device that inspired Colossus.